NB: I had not intended to take nearly 4 months to write more about my Kumihimo efforts, but between the holidays, my continuing obligations for The Noritake News, a herniated disc in my cervical spine, and a trip to Tucson (yah! ), I completely forgot that I had started to post about my Kumihimo work. 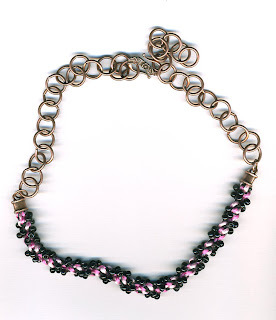 In fact, this post was originally meant to be a cross-posting of a series of pieces I wrote for the Beading Daily forums, mostly in response to a recent Beading Daily blog entry by Leslie Rogalski, who wrote about using wire and pearls for Kumihimo. The initial post in November was written from the perspective of learning a new craft and exploring possibilities. The following (and subsequent posts are more about conveying what I've already learned). I'm not an expert on Kumihimo, by any stretch of the imagination. I don't use a traditional marudai and tama, and I don't think I even want to, and if you want to really learn about the art and science of braiding, I definitely recommend reading Jacqui Carey's or Roderick Owen's books on Kumihimo and other braiding techniques. I've simply taken one class with a very good teacher, read and practiced and then extrapolated on the single technique of braiding with a foam disc, plastic bobbins and beads. In my daytime/non-beading life, I put a lot of effort into capturing "lessons learned" and publishing institutional knowledge for my company - and it seems to always carry over - I just like to educate, I guess. The traditional Japanese craft calls for a wooden marudai and weighted tama (bobbins) - and you work with both hands moving opposite strands in a variety of motions to obtain specific patterns. It's very difficult to work with beads using the traditional tools. Actually, its simply difficult to work with the traditional tools, period - with or without beads. The smooth wood and the need for weighted bobbins and counterweights on the growing braid are simply not conducive to moving beads. The Loom (Or Disc): The invention of the foam disc with 32 slots made working beads into braids extremely easy, since the foam slots hold the working strands in place, eliminating the need for weighted bobbins. There are two major manufacturers for the standard round 32-slot kumihimo disc - Hamanaka and BeadSmith. When you start with the basic "fill the slot" kumihimo braid (the best one for an all-bead braid), you need to orient the 8 strands equally, and this usually works best with cardinal compass points (NESW). Both the Hamanaka and BeadSmith versions have the cardinal points marked, but for some odd reason, the Hakamata disc offsets the points by a few degrees - so when you hold the disc and the logo is parallel to the floor, the strands form an X, rather than a cross, but since you need to orient the strands to a cross (cardinal compass points), this becomes awkward. The Beadsmith disc has the markings correctly oriented and aligned with the logo, so you start out properly. I did not know it at the time, but the person who taught me how to make beaded braids - Anne Dilker of Mosshollow Pottery - was working with BeadSmith on the new disc. Making your Own Disc. This can be done with 1/3" thick foam rubber - though you can definitely use foam core or cardboard (both of those will break down quickly, though). I've found the perfect round disc in the Children's craft section of Michaels' - it's sold as a "memo" or "pin" board, and you'll have to pull off the hanger from the back, but it the only piece of thick foam that I've found readily available. The foam stuff in the craft stores is very thin and you'll otherwise need to glue several layers together - which can be messy unless you can find the packages of pre-adhesive circles. When you cut your slots, try to keep the cuts short (no more than 1/3 of an inch, and it does help to cut a little of the foam away from either side (look at a premade disc to see what I mean), This will help getting your strands in and out of the slots, and keep finer materials from fraying. Bobbins: Bobbins are essential - in both large and small sizes. Even when making short braids, having your thread tails properly wrapped up helps ensure even tension. These are not sewing machine bobbins, but ones that are used by knitters. The best type are the disc shaped ones, called EZ-Bobs, which have flexible covers that pop opened with a little thumb pressure. You can get a set of 8-12 small bobbins for about $4 on eBay, or $8 for the larger ones. While you make only work with 8 strands at a time, it's always a good idea to have an extra bobbin or two around. The small sizes are good, particularly for short strands and when you are braiding with thin cording, and the larger for heavy cord, long strands or bigger beads. Counterweights: My teacher didn't think that counterweights were necessary when using the foam disc, but I disagree, I like to use a counterweight on the braid, particularly when starting out with lighter weight strands or a combination or light and heavy weight strands. My counterweight is a drawstring bag filled with pennies - and I can adjust as needed. When using a traditional marudai and tama, the corrolation between the weight of the bobbins and counterweight on the braid need to be pretty exact. Using a counterweight on a foam board is just a matter of determining what feels best and keeps the tension even on the growing braid. There have also been times when I've needed to counterweight the bobbins instead of the braid. After a few uses, particularly with heavy material strands (such as satin cord), the slots stretch. If you then go back to using thinner material strands, it becomes hard to keep even tension when the braid becomes heavier than the collective weight of the bobbins. For example, when I was working on a braid with eight strands of seed beads, I needed to keep a counterweight on both the braid and on each of the bobbins (which were, individually, quite light). For the bobbins, I used brass drops I found at Metalliferous. They had holes in them, so I used either safety pins or paperclips to attach to the far end of each of the braid strands. Satin Rattail - This is a smooth, shiny woven cord, soft and flexible - but also quite durable and not prone to fraying along the body. It is pretty much the most popular material for non-beaded braids. There are three sizes and two kinds of rattail. The sizes are referred to as Rattail (largest - 2 mm, and most popular weight), Mousetail (medium - 1.5 mm) and Bugtail (thinnest - 1.4 mm), and are either made from Rayon (wood-based fiber, US made. Expensive and can hard to find) or Polyester (petroleum-based fiber, Chinese made, very common and generally cheap). Both the rayon and polyester come in a wide variety of colors in the "rattail" size, and less variety in the other sizes. Except as noted below, all of these braids were made with satin rattail. The large diameter braid (third from the top) is a twelve-strand monster. Gimp - Shiny rayon or polyster thread coiled around a multistrand cotton base, equivalent in size to bugtail. Gimp can be found in spools or unwoven from upholstery trim. It's also a difficult material to use with a foam board, particularly a new one, since the coiled/wrapped covering doesn't hold up to the constant rubbing against the slots, and the bobbins, nor against pulling and retensioning. The green braid, fifth from the top has two strands of green gimp and the last braid in the arc (on the bottom, with the green beads) used six strand of gimp and two of Super-C for the beads. Knitting Yarn - Great stuff, particularly novelty stuff like ribbon yarns, eyelash yarns, ombres, etc. I strongly recommend checking out the closeout pages on WEBS, for single balls of really interesting yarn. I've had my eye on yarn made from recycled sari silk, and I'll provide an update when I finally do try it out. The one thing to be careful about is matching weights when you're mixing fiber types. Lightweight yarn should be mated with something that has a bit of body and strenght (like S-Lon or SuperLon) when other strands in the braid are made from heavier materials. The narrow pink, purple and black braid (second from top) is make with Japanese knitting ribbon paired with matching colors of SuperLon. Embroidery Floss - Great stuff too, and this is the traditional material for making "friendship" bracelets (a type of flat braid). An all-floss braid will be very small in diameter, but quite strong. An interesting treatment is to combine on or two separated threads of metallic floss with a strand of rattail into a single strand (one of eight). SuperLon or S-Lon: Nymo's really heavyweight cousin was invented for the shoemaker trade - this is the same stuff that holds the uppers to the soles of your shoes. 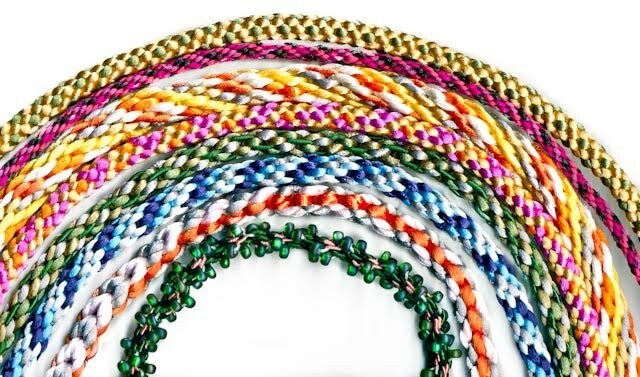 Althought this was the thread I was taught to use for beaded braids, I've found that it is a bit of overkill strenghtwise and can be hard to work with when using beads that have small holes, or when you really would like to use a big-eye or twisted wire needle when threading beads. The diameter of SuperLon is just too thick to pass through most beads when doubled. I do like to pair SuperLon with lightweight yarns on a single bobbin to give them strength and durability. Nymo: I have not had a good experience with Nymo - I've found it to delicate to withstand the constant pulling and friction on the disc. However, your mileage may vary. Beading Silk: I'm a big fan of Gudebrod spooled silk, for both stringing/knotting and for kumihimo. There is nothing like the slide of beads on silk, and the suppleness of the finished product. While there is a lot of length on a spool (in 20 years, I've only emptied ONE spool of silk), it is still expensive and a full range of colors can be hard to find. Pearl Cotton Embroidery Thread: This is the best substitute I've found for silk, and I've got a line on a great supplier who sells the thread on bobbins in a very wide range of colors - Threadart. Frankly, I bought the thread and figured that it wasn't going to work - that it would fray from the slots and the pulling - but it's as durable as silk (maybe more so). While the cotton is not as frictionless as silk, it's still a pleasure to use. Metal Wire: I do confess, I was left scratching my head after seeing and reading Leslie's post on Kumihimo last week when she used wire. No disrespect intended, but the results were less than pleasing to my eye. The wire looked kinked and the finished bracelet examples looked very stiff and uncomfortable to wear. The essence of kumihimo is the evenness of the braid - each strand fitting and interlocking, creating a seamless whole. Using wire for every strand (even "dead soft") defeats that. I can see where a thin wire, married with rattail, could result in a very pleasing, albeit stiff, braid, but I'm just not on board with eight strands of stiff wire. Sorry. Coated and Cabled Beading Wire (Beadalon, Tigertail, Softflex): Not something I would recommend under regular circumstances (see the "Beads" section for irregular circumstances). This stuff is expensive, particularly the 49 strand material that has the best drape and flexibility! Why waste it in a braid? Fireline and Other Braided Filiments: Useful for particular circumstances (see "Beads" section for further explanation). A note about thread color. When creating an "all bead" braid, the color of your thread will be of minimal importance, unless you are using transparent beads. The thread is fully buried inside of the braid, so you'll usually will never see it, but if your beads are large, or irregular, the thread may be visible within the work. If you're a perfectionist (like me), you'll probably want to match your thread to your bead color regardless. When beads are on only a few strands of a braid, color will be more important, since you'll see the bead strand thread within the body of the braid. I am really enjoying your series and find your perspective interesting. I do have one comment regarding your thoughts on how it is difficult to work on a mardudai as opposed to working on a beading disk. I learned kumihimo on a homemade (from a very large ice cream bucket) and then went on to transforming a kitchen stool into a wonderful marudai substitute. I am really hoping for a real marudai for mother's day though. I say all that to say that I am somewhat biased. Not long after I started being interested in kumihimo, the kumihimo disks began to appear, here, there and everywhere. I did eventually purchase a couple of different one and I really appreciate their portability, affordability and their diminutive size. It is easy to have more than one project on the go with these lovely things. However, I very much disagree with your statement, "Actually, its simply difficult to work with the traditional tools, period - with or without beads." I find it easier and indeed, much more pleasant to work on a marudai that on the disks. I find that for simpler designs, I get into a wonderful meditate zone with the marudai that I could never achieve on a disk or plate. I find it much easier to work with the marudai, The wonderful rhythm makes it a joy to work with. This is, of course, just my opinion. I encourage you to try working with a marudai and real wooden tama if you ever get the opportunity. It really can be a wonderful experience. More so that with the disk, in my opinion.